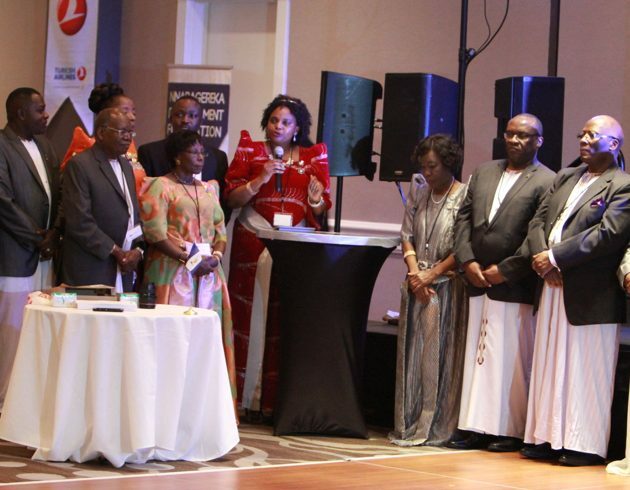 Ugandan Diaspora News — Day Two of the Buganda Bumu Convention was underway on the Sunday starting with a church service led by Dr.Rev. Alex Kasirye-Musoke of the Anglican church of Uganda – Boston. Later it was back to more cultural panel discussions that included Kojja and Ssenga sessions. The youth also held their breakout meetings led by John Ssemanda of the Breaking Barriers initiative. 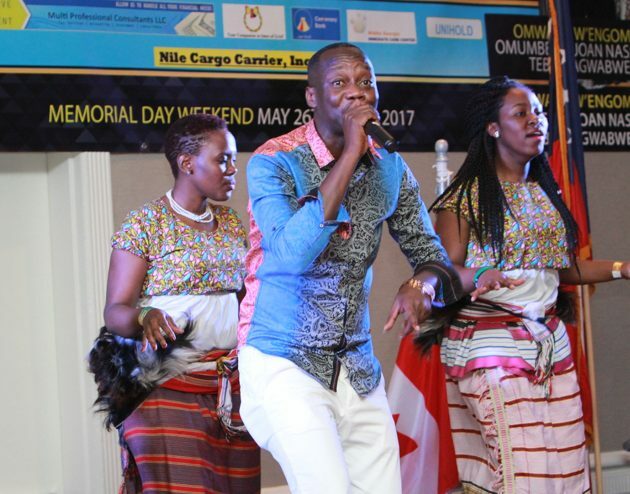 Other highlights including a BBNAC executive meeting that also voted the U.S. Capital of Washington DC as the next Buganda Bumu convention host city in 2019. As the evening set it it was time for the grand finale dinner that saw the official closing ceremonies led by the Omumbejja Joan Nassolo Tebattagwabwe who had delivered the Kabaka’s message to the convention attendees the day before officially closed the event. 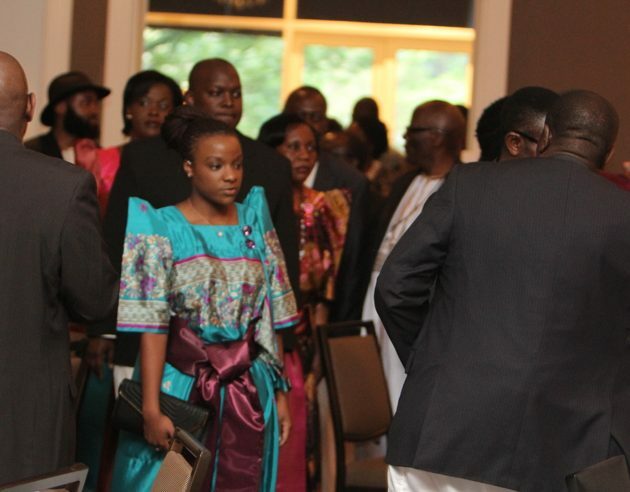 She was then followed by the Kingdom Premier Owek. Charles Peter Mayiga who delivered an hour long speech articulating the changes and progress in the Kingdom of Buganda today. Key elements in his speech included discussion of the ekyapa mungalo as one of the ways to address the land issues, addressing kingdom critics and shared the dangers of misusing social media! 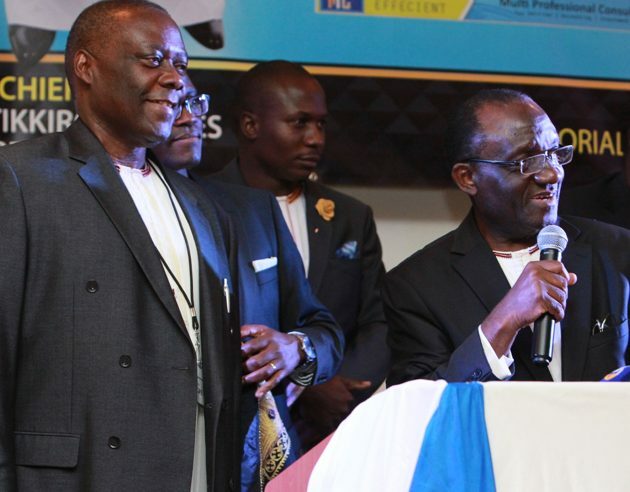 Among those traveling with the Katiikiro were the deputy Katiikiro, heads of royals institutions like the Majestic Brands, Buganda Land Board, Buganda Investment Body, Nabagereka Foundation, Clan heads and officials responsible for the royal Kingdom protocol. The Central Government Chief Whip — Hon. 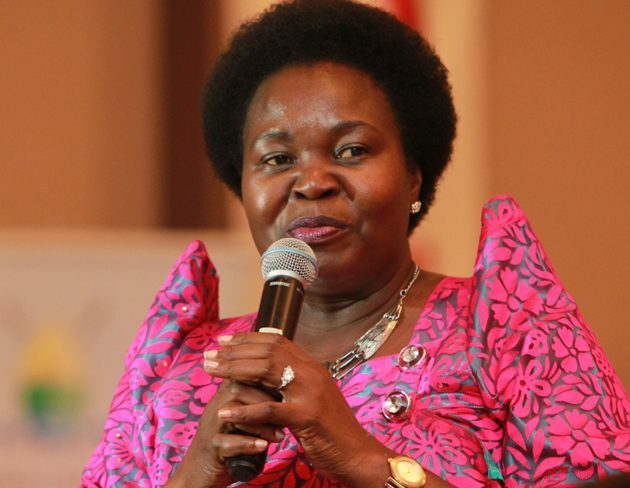 Ruth Nankabirwa also attended the event as did members of Buganda caucus from the Parliament of Uganda. After a series of speeches and introductions it was then time for dinner and the evening entertainment. 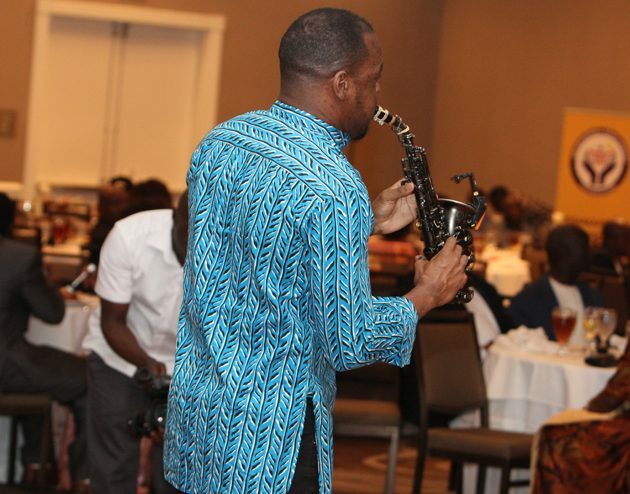 Uganda’s jazz maestro Isaiah Katumwa treated guests to some soulful jazz tunes before renown kingdom loyalist Meshach Semakula took to the stage with the his royal kingdom anthem ‘ka nyimbire omutanda’ that had every one on the dance floor. DJs Core and Benazo did not disappoint treating the audience to some old skool ballads. 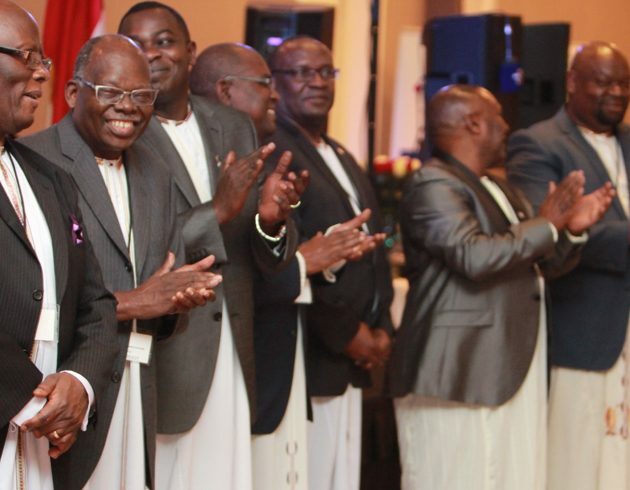 We salute the Agali Awaamu Atlanta chapter together with the BBNAC executive for successful organizing the second Biennial Buganda Bumu North American convention that attracted more than 500 delegates. 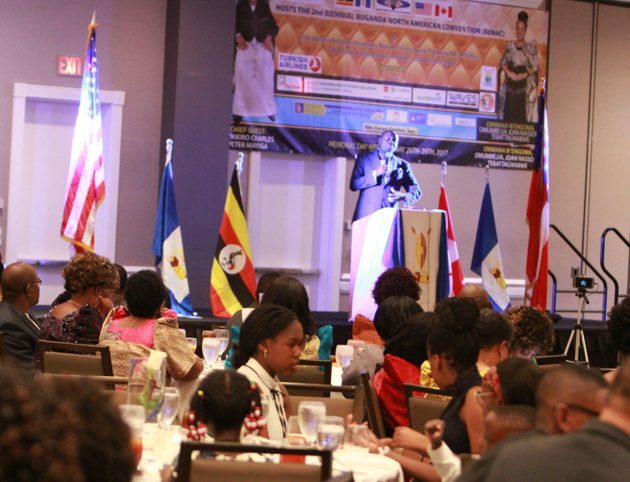 As the organizers plan to host the next convention in Washington DC areas of opportunity should include better time management, a reduction in the number of panels, inclusion of feedback sessions, add kiganda cultural foods on the menu, cutting edge entertainment, a better marketing strategy that involves aggressive social media campaigns and the introduction of a Buganda Diaspora Sacco/Development Fund. A special thank-you to all the 2017 partners and sponsors that included World Remit, UAP-Clinic Diaspora Medical Insurance, Waves Affordable Housing, Turkish Airlines, BBNAC Central Executive and the Agali Awaamu Atlanta Chapter! 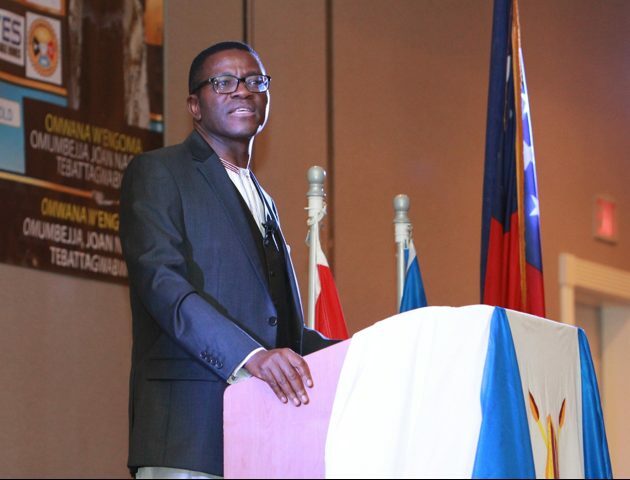 The following resolutions were adopted after the successful conclusion of the Second Buganda Bumu North American Convention (BBNAC) held from May 26th through the 28th 2017, in Atlanta Georgia. We, the people of Buganda and all of our friends who have attended the 2017 BBNAC convention here in Atlanta Georgia, are grateful to Ssaabasajja Kabaka, Ronald Muwenda Mutebi II, for his inspiring message supporting the objectives of BBNAC and wishing all of us a successful and productive convention. Ssaabasajja Kabaka’s message was delivered by Princess Joan Nnassolo Tebattagwabwe. We are very grateful to Ssaabasajja Kabaka for his leadership and support for BBNAC causes, through his representatives (Ababaka) in North America. Ssaabasajja Kabaka’s representatives play a very important role in strengthening our communities here in North America. It is our humble request and wish that Ssaabasajja Kabaka to participates in our next convention scheduled for Friday May 24th through the 26th, 2019, in Washington DC. We are very grateful for the leadership of Katikkiro Charles Peter Mayiga and the great work that he has done and continues to do for the continued holistic development of Nnyaffe Buganda and her people. We are very grateful to the leaders of Agali Awamu Atlanta for hosting the 2017 BBNAC convention. We are also grateful to the leaders of BBNAC for working closely with Agali Awamu leadership to make this event a success. We pledge to continue working hard to educate the Youth and children in our community about our cultural norms, customs, and our language, — Luganda. We also pledge to encourage the Youth to participate in all endeavors and projects planned for the continued development of our homeland, Buganda. We in the leadership of BBNAC pledge to strive to educate everyone in our communities about the benefits of obtaining life insurance, and participating in productive investment for the future. We welcome and support the Buganda government initiatives and programs relating to land ownership in Buganda, which have been explained to us in this convention by Buganda government officials. This is beautiful! Wonderful convention, great topics of discussion, great entertainment, great food, and of course, great city of Atlanta! Thank you Agali Awamu and BBNAC!! And thank you Diaspora News for getting this to us. I can’t wait for the next convention! See you all in Washington DC come May 2019!! Thank you very much for the coverage of this great event. Hello fellow Baganda this is a landmark in our history. Thank you so much for the initiation. I would like to be part of the celebrations of 2019 as a a performing ARTISTE as well as an academician in ethnomusicology.